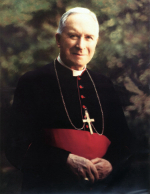 We present here some excerpts from the book Marcel Lefebvre: The Biography which outline the first reactions of Archbishop Marcel Lefebvre to the Novus Ordo Missae and how he was compelled to eventually oppose assisting at the New Mass. It is true that prudence might suggest to this or that priest “not to refuse the new Ordo for fear of scandalizing the faithful” by their witnessing his apparent disobedience to the bishop. Such a priest should, however, “keep the Roman Canon which is still permitted, and say the words of consecration in a low voice according to the old form, which is still allowed.” When Archbishop Lefebvre was absent on a Sunday, the seminarians would go and assist at Mass together at the Bernadine convent of La Maigrauge where an old monk celebrated the New Mass in Latin. The Archbishop was not a man to rush souls. He allowed himself time to seethe fruits more clearly in order to pass better judgment on the tree. He also wanted to hear the opinions of his colleagues in the episcopate, and find a consensus among his friends. Can we, the bishops, be silent? Can we, pastors of souls, follow a via media, saying nothing and leaving each priest to follow his conscience as he wishes at such risk to so many souls? And if we say openly what we think, what will be the consequences? We will be removed... leaving many of the faithful in confusion and scandalizing the weakest souls. In January 1970 the Bishop of Campos had already solved his doubts. He translated the Short Critical Study and distributed it among his priests. It seems to me preferable that scandal be given rather than a situation be maintained in which one slides into heresy. After considerable thought on the matter, I am convinced that one cannot take part in the New Mass, and even just to be present one must have a serious reason. We cannot collaborate in spreading a rite which, even if it is not heretical, leads to heresy. This is the rule I am giving my friends. 40 Spiritual Conference, Fribourg, Nov. 9, 1969. 41 Letter to a young priest, Sierre, Feb. 16, 1970. 42 Bishop de Castro Mayer, Letter to Archbishop Lefebvre, Oct. 5, 1969. 44 Letter of Feb. 17, 1970, to Gerald Wailliez. Archbishop Lefebvre did not found his Society against the New Mass, but for the priesthood. However, the concerns of the priesthood now brought him to reject the new Ordo Missae. is ambivalent and ambiguous because one priest can say it with a totally Catholic faith in the sacrifice, etc., and another can say it with a different intention, because the words he pronounces and the gestures he makes no longer contradict [other intentions]. Make every effort to have the Mass of St. Pius V, but if it is impossible to find one within forty kilometers and if there is a pious priest who says the New Mass in as traditional a way as possible, it is good for you to assist at it to fulfill your Sunday obligation. Should all the world’s churches be emptied? I do not feel brave enough to say such a thing. I don’t want to encourage atheism. To avoid conforming to the evolution slowly taking place in the minds of priests, we must avoid - I could almost say completely - assisting at the New Mass. 10 Spiritual Conferences at Econe, Dec. 10, 1972. 15 Letter to M. Lenoir, Nov. 23, 1975. 16 Spiritual Conferences at Econe, 42 B, March 21, 1977. 17 Circumstances he considered decisive in 1974: Spiritual Conferences at Econe, March 7, 1974, and April 1, 1974.